TAI works with current and new leaders to earn influence, build strong coalitions, establish sound direction and maximize their leadership effectiveness—we help leaders lead from the inside-out, guiding and renewing them to positively impact corporate results. TAI works with high-potential employees and emerging leaders to insure a sustainable growth culture—we help emerging leaders embrace a values-based philosophy and encourage them to understand who they are before determining what they plan to do. TAI works with new hires and newly promoted leaders to successfully on-board in their new roles. Focus is placed on establishing personal leadership credibility, creating strong relationships, building cohesive and effective teams and achieving early wins. Read more about On-boarding new leaders here. TAI works with executive teams to create unity of purpose and bring teams together to reduce—or even eliminate—functional silos, personal agendas and office politics. TAI works with leaders to create a positive corporate culture—a culture where leaders align employees on a worthy mission and motivate them toward values-based behavior to create true competitive advantage and achieve sound execution and sustainable high performance. TAI Incorporated also offers consulting, executive coaching, team alignment seminars, and cultural integration initiatives to help you create a high performance culture in your organization...and as every leader knows, performance is what matters in delivering desired results. Our consultants are seasoned business executives who work closely with leaders to build Awareness–Alignment–Accountability, the process necessary for creating values–based performance. The demands of leaders shift constantly. Given market changes, ever changing responsibilities, customer relationships and team dynamics, the only constant is change. TAI provides values-based executive coaching for current leaders to develop and maximize their leadership impact by helping them navigate change, articulate direction, earn influence, build high performance teams and create results-driven corporate cultures. The first 100 days of a new leader’s tenure represent both unique opportunities and incredible risks. Our consultative approach to new leader on-boarding gives newly placed executives the jump-start and early wins needed to firmly establish themselves in new roles. Read our article about the On-boarding process here. Perhaps the most valuable asset to any company is its emerging leaders—leaders that can be grown, cultivated, developed and deployed. Our individualized approach to developing high-potential and emerging leaders insures strong bench strength, enhances retention of key talent and prepares emerging leaders for roles of increasing scope and responsibility, all in support of a values-based culture. Probably the greatest opportunity for creating true competitive advantage lies in developing aligned and effective high performance teams. Key areas of focus are: mission—to create purpose; values—to determine behavior; trust—to establish unity; alignment—to enable productivity; accountability—to insure performance. TAI offers customized seminars and team coaching to promote maximum performance and effectiveness of teams. Organizational culture is a direct result of leadership attitudes and behavior, emulated by followers, and has a critical impact on the organization’s ability to drive desired and predictable results. TAI works with leaders to create a positive corporate culture—a culture where leaders align employees on a worthy mission and motivate them toward values-based behavior to create true competitive advantage and achieve sustainable high performance. Our methodology includes coaching and "visioneering" for the organization’s leader, seminars to create the organization’s specific value-set and group training to cascade and implement those values throughout the organization. Our leadership development offerings focus on maximizing leadership effectiveness, building high impact teams and establishing performance-based corporate cultures. "Every CEO and leadership team will benefit from the insights and methodology found in The Imperfect Leader. 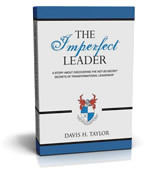 Davis Taylor brings unerring integrity and focus to the process of aligning leadership teams on common values, mission and vision. He also challenges business executives to understand that it is not about me, a realization that can bring waves of positive change throughout the organization. Read the book and challenge yourself to become a Values-based Leader."